I'm sure you all know someone who in the past has tried their hand at home brewing beer. 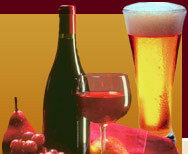 For many the thought of producing their own home brew wine seems to be more of a daunting notion. Well whether your preferred tipple is sweet, dry, rose, white or red - if you are able to follow basic instructions then you'll find brewing your own wine to be a simple process. The end result being a wine comparable in taste to the best sellers, but created at a fraction of the price! As with producing your own beer or cider you first have to decide whether to opt for a wine brewing kit or start from scratch by purchasing the ingredients separately and creating a truly individual wine. These kits are available online or from your local brew shop. They often come with everything you need to make your first batch of home brew wine. The kits are available from under £20, costing just over £1 per bottle and produce a quality ready to drink wine in under 28 days. For more information follow this link to our home wine kits page. If you choose this option you will find that everything you need to produce your wine should come with the kit. This refers to wines made from ingredients other than grapes. For a unique tasting wine try following recipes for elderberry, rosehip, apple or banana wine. They may sound strange but you can create a truly individual tasting wine that will be a real conversation piece at dinner parties. Country wines do take longer to mature, up to 18 months in some cases, although they are most definitely worth the wait. - The English translation of a national quality level of wine above table wine but below quality wine in several European countries, such as French vin de pays and German Landwein. Below are the basic ingredients required to make your own wine. Sugar - household white sugar is fine. Water - If you live in an area where water straight from the tap tastes fine and has no after or off taste to it then this is fine to use, otherwise boil first. A quality grape concentrate - this is available on-line or from your local brewing shop. A rough guide is one can of grape concentrate per gallon of wine. Campden tablet - Used for sterilisation of equipment which is essential. If the equipment is not sterilised properly the result can be a liquid that smells and tastes like vinegar. Yeast. This is required to ferment the liquid and will do so with the aid of the sugar. Citric acid - used to increase the acidity of the wine which has a great affect on the end taste of your brew. Grape tannin - These originate from the skins of the grapes and give extra flavour to the end product. Finings - Assist with reducing the cloudy appearance of the wine. Now you have everything you need to produce your wine please follow the guide on our home wine brewing page to create your own wine at home.